AMD’s air cooled Fiji board, the Radeon R9 Fury, has finally launched with reviews of Sapphire’s Tri-X and Asus’s Strix models now aplenty. The new Fiji based Radeon R9 Fury graphics card is the air cooled younger sibling of the company’s water-cooled $650 R9 Fury X flagship. 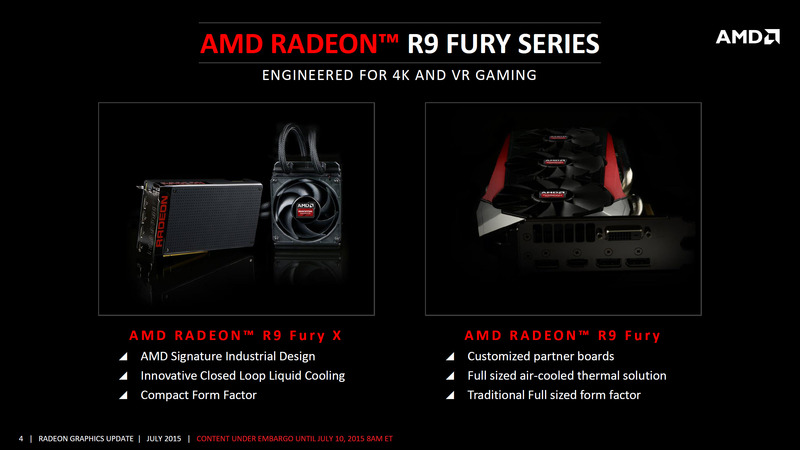 The R9 Fury comes in a variety of custom Add-in-board flavors, the first to launch of which are the two cards mentioned earlier from Sapphire and Asus. Interestingly both offerings have something very special about them that we mean to touch on today. 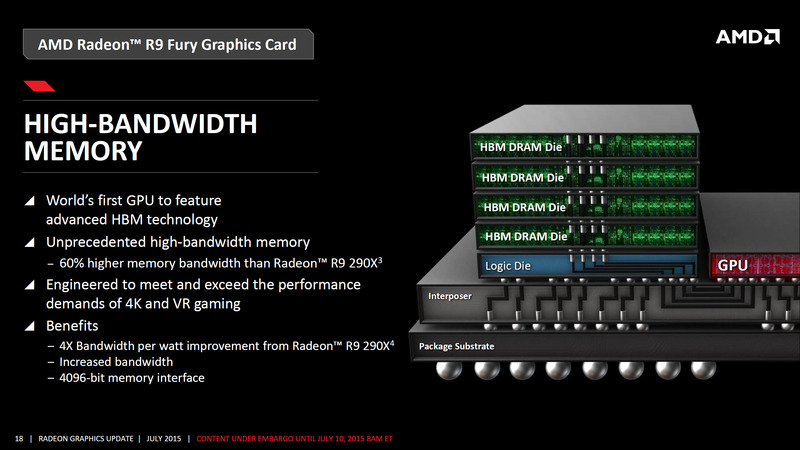 Let’s first talk about the Sapphire Radeon R9 Fury Tri-X. This card packs a triple fan cooling solution featuring a large high density heatsink, making the card thicker than standard 2 PCIE slot graphics card designs. The three fans that Sapphire decided to go with aren’t the standard affair seen on the previous 290 series tri-x cards, or current 390 series tri-x cards. Sapphire decided to go with slightly larger fans that have a significantly deeper blade curvature. These fans are in fact identical to what we’ve seen from Sapphire on the vapor-X 7000 series, namely the HD 7950 and HD 7970 Vapor-X cards, and they’ve been evidently put to very good use on the Fury. These fans maintain a higher static pressure and move a lot more air than what the standard “dual-X” and previous “tri-X” fans are capable of. Which allows Sapphire to keep them running at much lower RPMs to maintain a very gentle acoustic thumbprint, in other words they enable the creation of significantly quieter cooling solutions. And the R9 Fury Tri-X stands as a testament to this. 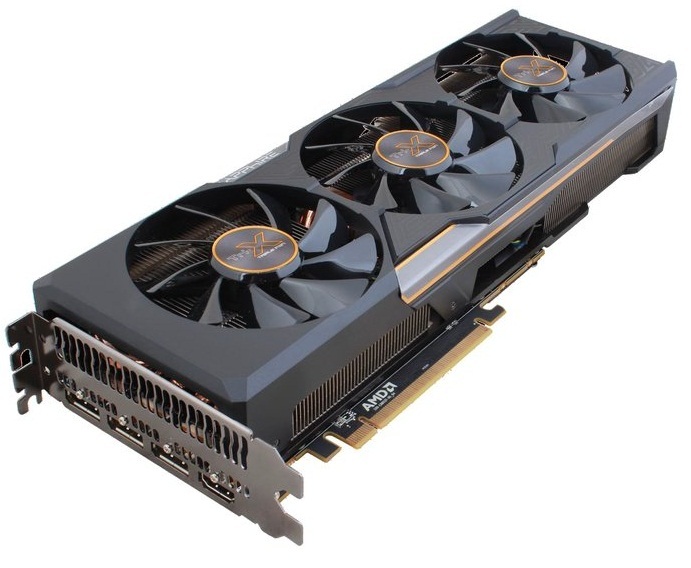 At full load the card is significantly quieter than the quietest reference designed graphics card to date, which is the water-cooled Radeon R9 Fury X. In Kevin’s Carbotte’s review of the card over at Tom’s Hardware, even with a factory overclock, the Fury Tri-x produced 37 deicebls of noise under a full gaming load. Which remarkably was actually below the ambient noise, making it completely inaudible according to Kevin. The graphics card can’t really be heard above the background noise. To put those numbers into perspective, the Sapphire Radeon R9 Fury Tri-X at full load produces the same amount of noise as the Nvidia GeForce GTX 980 Ti at idle. Making it the quietest high-end air-cooled card we have seen to date. When it came time to run our load noise testing we were expecting good things from both cards, but the results from the Sapphire Tri-X have completely blown our expectations. With sub-40dB(A) noise levels we ended up running our load noise test three different times in order to make sure there wasn’t an error in our testing methodology. There wasn’t. What we have here then is the quietest high power air cooled card we have ever tested. 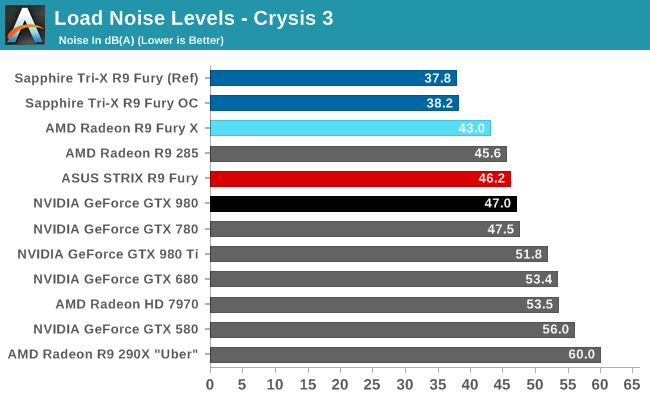 In its OC configuration the Sapphire Tri-X card tops out at 38.2dB under Crysis 3, less than 2dB(A) above our noise floor and nearly 5dB quieter than the quiet R9 Fury X. Switching to its reference configuration drives noise levels down even further, to just 37.8dB(A). To put that in perspective, the Sapphire Tri-X under a gaming workload is as loud as the GTX 980 Ti is at idle. Simply put, these results are amazing. Thankfully Sapphire delivers this unheard of whisper quiet nosie level without compromising temperatures. So it’s clear that Sapphire has created quite a phenomenal card here in terms of performance and acoustics. This is in part thanks to the notably over-engineered cooling solution and in part thanks to the compact nature of the PCB design enabled by HBM. The short PCB allows the air to be pushed directly through the heatsink rather than be blown onto the PCB. This allows the air to move more readily without creating turbulence which is traditionally a major contributor to the overall noise production of air coolers. While the Sapphire Radeon R9 Fury Tri-X is indeed extremely impressive, the STRIX from Asus also has something that’s equally impressive, namely its power consumption. Just like the Tri-X from Sapphire, Asus is selling the STRIX with a modest factory overclock. 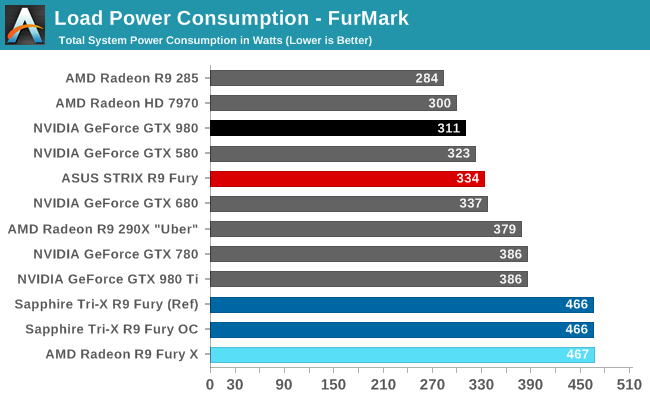 However, even compared to Sapphire’s reference clocked Fury, the STRIX uses significantly less power.Interestingly, Asus rates the Fury STRIX as a 219W graphics card while Sapphire rates its Tri-X as a 300W card. In real world testing, the Fury STRIX from asus consumes 47W than Sapphires factory overclocked Fury Tri-X and 29W less than the same card running the reference 1000mhz clock speed. Interestingly Asus has designed a custom PCB for the Fury STRIX, unlike Sapphire which opted for the reference PCB layout, which is what this reduction in power consumption is attributed to. While 29W less at the wall for the same performance using the same chip might seem impressive, the effect of Asus’s custom PCB is even more profound in the Furmark torture test. 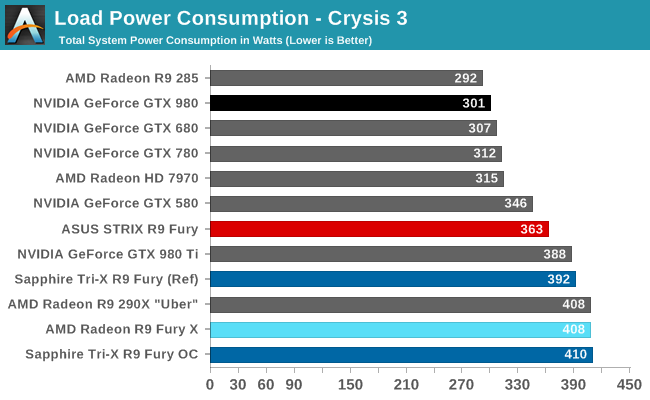 Where the Asus Radeon R9 Fury STRIX consumes 122W less than the Sapphire R9 Fury Tri-X. This just goes to show how much power efficiency can be gained from tweaking the PCB layout and choice of components. Now when it comes to choosing between both card’s it’s there are multiple things to consider. 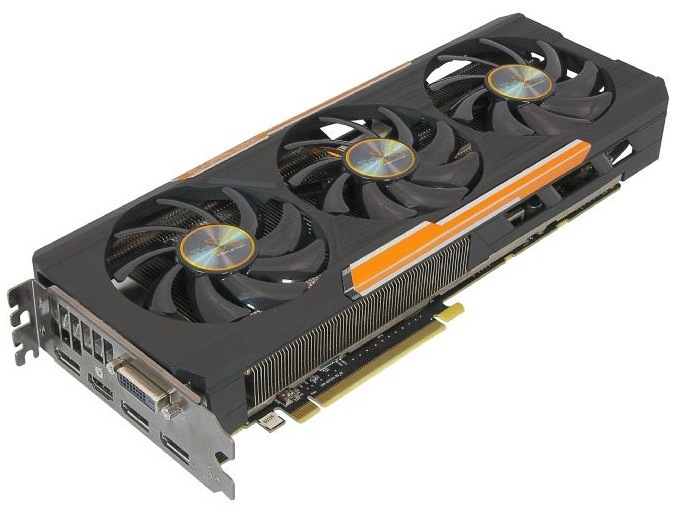 In terms of noise levels there’s just no high-end air cooled graphics card that beats the Sapphire Fury Tri-X. 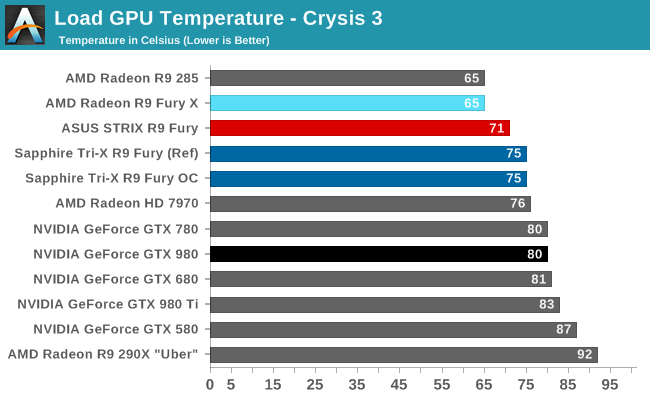 The Asus R9 Fury STRIX runs about 4c degrees cooler but also generates significantly more noise. The card uses noticeably less power however and the custom PCB may prove to be a boon for overclocking. However until the overclocking software from both camps is updated to recognize the VRM’s of these cards to enable voltage adjustments it’s going to be hard to predict which will overclock more generously. It’s fascinating how two cards based on the exact same chip can offer such a variety of advantages and such distinctly different appeals. We’re excited to see what the rest of the AIBs will come up with. From what we’ve been hearing there will be even more surprises, so stay tuned.